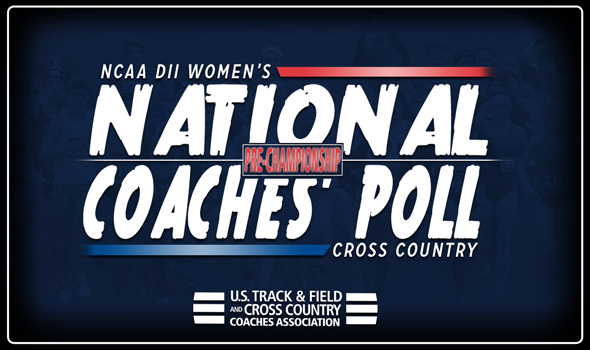 NEW ORLEANS – While changes were abound in the men’s portion of the NCAA Division II Cross Country National Coaches’ Poll, the top teams in the women’s rankings cemented their positions after solid outings at the regional meets. The top-four teams in the most recent rankings, announced on Wednesday by the U.S. Track & Field and Cross Country Coaches’ Association (USTFCCCA), held their ground from a week ago. Cal Baptist, Grand Valley State, Adams State went 1-2-3 in the polls once again after winning their respective regions, while Alaska Anchorage remained in fourth after a runner-up finish to Cal Baptist at the West Regionals. U-Mary represented the lone change in the top-five, returning to the grouping for the first time since week two after capturing the Central Regional team title behind a first-place finish from senior Alexis Zeis (20:35.5). Cal Baptist defeated Alaska Anchorage by a score of 68 to 84, thanks to second- and third-place finishes from Anett Somogyi (21:04.5) and Emeline Delanis (21:08.6). The Seawolves’ Caroline Kurgat won the individual title at the meet with a time of 20:26.1. Cal Baptist picked up seven of the eight first-place votes on the week. GVSU was dominant at the Midwest Regional Championships, winning by 35. The Lakers got three top-10 finishes at the meet against the likes of fellow top-10 teams Hillsdale (eighth) and Walsh (10th). Adams State picked up the final first-place vote thanks to top-three finishes from Malena Grover (21:03.6), Eilish Flanagan (21:15.1) and Roisin Flanagan (21:21.6) that aided the Grizzlies in defeating Colorado Mines (11th) by an astounding 56 points. Rounding out the top-10 were Chico State (sixth), Simon Fraser (eighth) and Pittsburg State (ninth). The Wildcats and Clan finished third and fourth, respectively, at the West Regionals, while the Gorillas placed second at the Central Regionals. Two teams saw big boosts in the polls to put them right on the cusp of the top-10 this week. Augustana (S.D.) moved up eight spots to 12th and Western State jumped 11 spots to 13th. Each team posted third-place finishes at their respective regions, with Western State missing second place by just five points and Augustana (S.D.) missing by eight. Northern Michigan (15th) and UC-Colorado Springs (17th) both moved up two spots, while Cal Poly Pomona joined them in climbing towards the top with a three-spot jump to 19th. Saint Leo returned to the top-25 after falling out of the polls a week ago. The Lions came in at 20th this week, fresh off a South Regional team title and three top-10 individual finishes that included an individual title by Colett Rampf (20:49.2). Edinboro also broke into the top-25 for the first time on the season. The Fighting Scots took home the Atlantic Region team title this past weekend.